The widening gap between what the US pays for Canada's heavy oil and the international benchmark for crude – pegged at $32.11 on Wednesday – make the Keystone XL and Enbridge's Northern Gateway pipelines vital to the future of the oil sands. But even if both are built, bitumen is expensive to extract and cannot compete with the many new shale oil plays – particularly in the Bakken oil basin where studies put the recoverable oil at 24 billion barrels – which have pushed US production to its highest level in a decade. No wonder Enbridge – busy building out its capacity in Bakken while Northern Gateway wallows in the approval process – said yesterday "it's the wild west out there at the moment." The Globe and Mail reports the rise in domestic production stands to vault the US within striking distance of being the top global crude producer by 2017, up from third today – a change that will lessen its reliance on foreign imports. The dramatic rise in domestic oil production in the US is driven by new technologies and new finds particularly in the Bakken oil basin that covers Montana, North Dakota, and Saskatchewan. Output from the Bakken fields topped 420,000 barrels a day in July from zero a few years ago. Steve Wuori, head of liquids pipelines at Canada's No. 2 pipeline company, told Reuters on Tuesday: "It's the Wild West out there at the moment. I hear stories of railcars being loaded by men standing on top of the railcar holding the hose, with a 55-gallon drum cut in half for their firewater protection system. It is a real, real Wild West, cowboy type of thing that's going on as people scramble to get crude onto rail in any possible way they can." Booming oil production in the United States is placing serious pressure on Canada’s oil sands industry, forcing down prices at a time when labour and equipment costs for the industry are climbing at a much higher rate than inflation. Projects in various stages of planning and development worth more than $100 billion are now being put at risk if other export markets can’t be found. Canada exports some 2 million barrels of crude oil to the US and 500 million barrels of petroleum products each day. Canadian heavy oil is only exported to the US and sells for $10+ less than US crude, meaning oil sands developers have to deal with an effective oil price of $60-$70 a barrel. While the threat to oil sands producers in the North of Alberta is real, the province and Canada could share in some of the spoils from the Bakken fields. 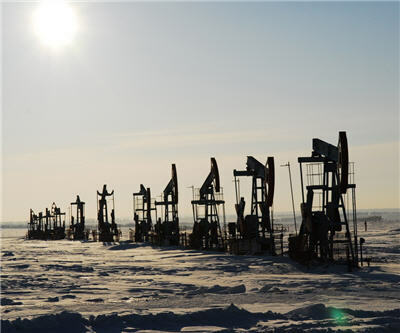 The Calgary Herald reports on Wednesday an early-stage Bakken oil play that straddles the Alberta-Montana border will produce 2.6 billion barrels, more than Canada's largest conventional pool, if a bold new prediction by researcher Wood Mackenzie holds true. More than 50% of Canada's oil production came from the oil sands last year and Alberta production is set to more than double to 3.7 million barrels by 2025 out of a total of 4.7 million. The US produces 7.8 million barrels/day and according to a new Goldman Sachs report will grow that to 10.9 over the next few years. In a 2011 study forecasting the economic impact of oil sands up to 2035, the Canadian Energy Research Industry said employment from oil sands would increase almost 10 times to 905,000 jobs, adding about C$2.1 trillion to the national economy, or C$84 billion a year from the oil sands alone. These figures may now begin to look too optimistic.